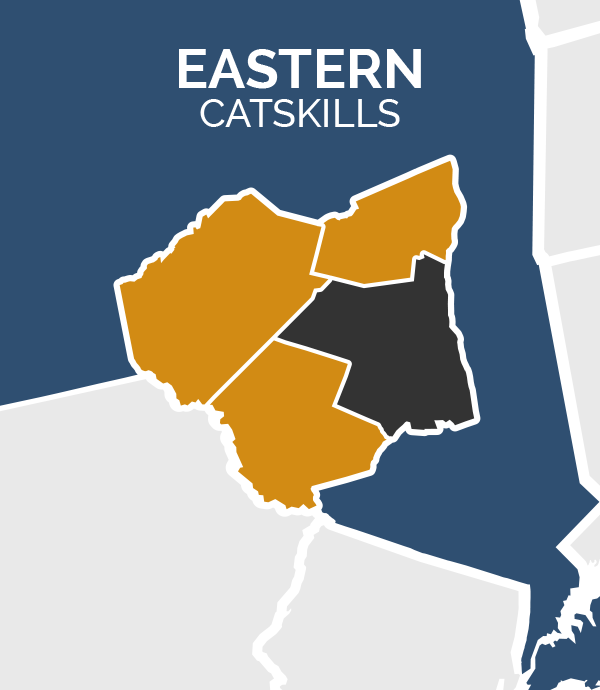 The Catskill Region is the perfect camping destination for families, friends, and solo-travelers alike. Towering peaks, sweeping valleys, roaring rivers, and untamed forests provide endless recreation opportunities for experienced explorers and those new to the outdoors. Begin a family tradition at one of the Catskill’s public campgrounds, enjoy a romantic glamping getaway, or journey into the backcountry and sleep under the stars. Enjoy the beauty and excitement of the outdoors while also benefitting from modern amenities! Families and casual campers can enjoy an authentic camping experience without entirely disconnecting. New York State Parks and regional KOA campgrounds, such as North-South Lake Public Campgrounds, Saugerties/Woodstock, and Russell Brook Campsites, offer conveniences such as swimming pools, showers, restrooms, and running water and electric outlets at your campsite. Public campgrounds are a great introduction to some of the best camping in the Catskills. Many locations feature hiking and biking trails straight from the grounds into the surrounding mountains and valleys. Some even offer guided trips and gear rentals to help you make the most of your Catskills camping experience. 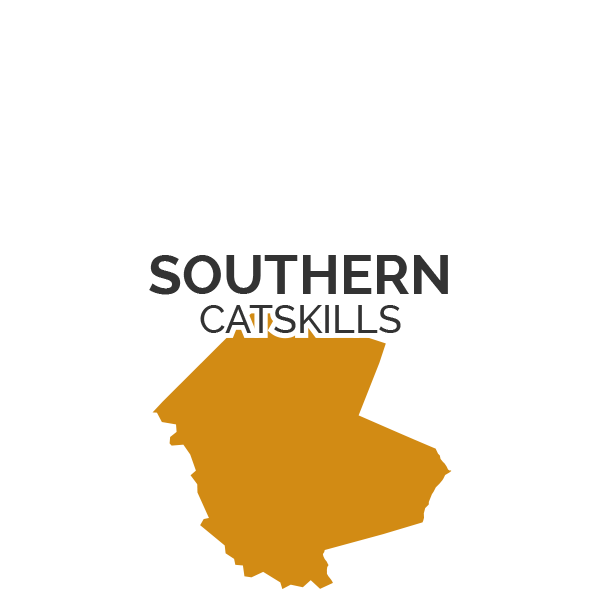 Catskill Adventure Resort: Located in Wurtsboro, Sullivan County, Catskill Adventure Resort provides comfortable family camping, a private pond, an onsite skate park, and a swimming pool. RVs welcome! 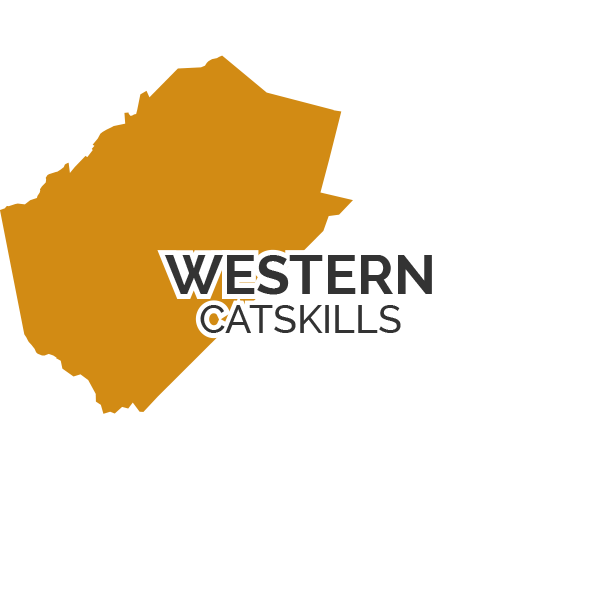 Located on the banks of the Beaverkill River, this Catskills campground accommodates cabin, RV and tent camping, and offers modern conveniences such as Wi-Fi, cable TV, and a camp store. Add to your camping experience by renting tubes, kayaks, mountain bikes, or even park facilities for private events! Escape the city, but keep the convenience! Tent, cabin, and lodge sites are available at this campground, just two hours north of New York City. Enjoy access to the camp store, laundry, showers, a recreation building, swimming pool, fishing and even a wine store! Take part in planned activities, themed weekends, and New York City tours between April and October. In Mount Tremper, accessibility meets adventure. Among the offerings at Kenneth L. Wilson Campground are boat rentals and an accessible launch, an accessible fishing pier, hiking and biking trails, and even hot showers! Both tent and RV sites are available. Located in the mountain town of Hunter, Devil’s Tombstone is one of the older campgrounds in the Catskill Forest Preserve, offering both scenic beauty and devilish mystery. Primitive camping is available at 24 lakefront sites, and amenities include nearby hiking trails, boating, fishing and swimming. With 41 tent and trailer sites to choose from, Bear Spring covers over 7100 acres and is the only state park in New York intended specifically for horseback riding. The park trails are also suited for mountain biking, hiking, snowmobiling, and cross country skiing. Most of Bear Spring Mountain is a Wildlife Management Area. Who said camping can’t be classy? Add a bit of glamour to your next adventure and experience glamping in the Catskills! Glamping is a growing phenomenon that combines traditional camping with total luxury. Picture this: You’ve spent the day hiking and biking the mountains and valleys of the Catskills. You head back to camp for some rest and relaxation. Instead of crawling into a tent and fighting with a sleeping bag, you have a real mattress to stretch out on! Whether you’re planning a unique girls’ getaway or a romantic weekend with your partner, glamping is sure to provide a once-in-a-lifetime experience and some seriously awesome shots for the ‘gram. Book your stay at Blue Hills Farm Tent & Breakfast for a premium glamping experience. A canvas safari-style tent for two with a queen size bed and an attached heated bathroom complete with a shower and spa jets will keep you in total comfort. Fuel up for your day with a delicious homemade breakfast, served in a nearby log treehouse. Then, venture out and explore the lush surrounding forest, fish along the Upper Delaware River, or journey into nearby Narrowsburgh to experience the burgeoning local arts scene. New this year is Eastwind Hotel & Bar, a scenic and welcoming boutique hotel with a glamping flair. 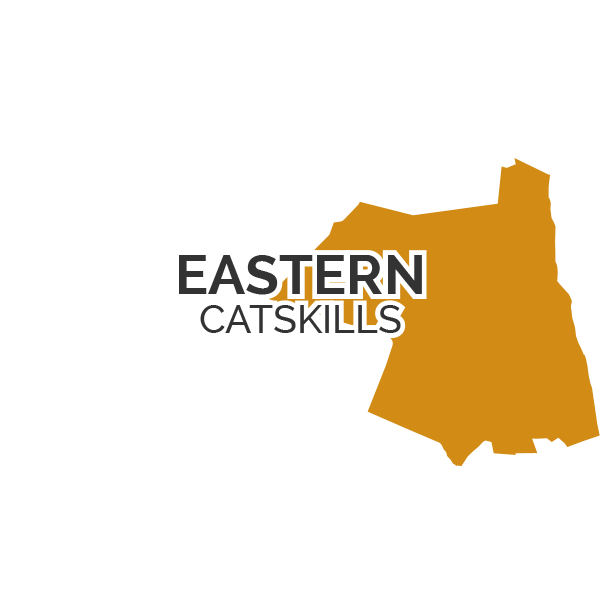 Nestled in the heart of the Catskills, Eastwind blends the outdoors with a high end hotel experience. Of their 19 total accommodations, three are Lushna Cabins, minimalist structures designed for four-season glamping. It’s camping without sacrificing comfort. Before you cozy up for the night, lounge around the fire pit with a specialty Salon cocktail and enjoy views of Windham Mountain. For a more secluded camping experience, visit Willowemoc Wild Forest Yurt on the edge of the Willowemoc Wild Forest and Catskill Forest Preserve in Livingston Manor or Bellfire Tipi in Meeker Hollow, where you can enjoy total tranquility, custom-made furniture, wool carpets, cedar floors, and artisan décor on 10 acres of forest land. Woodstock Meadows, just two miles from the Town of Woodstock, is perfect for a romantic glamping getaway. Their two safari-style tents are located on 24 acres of mountain meadows, streams, ponds, and hiking trails, and are as comfortable as any bedroom. For the added effect of fame, head to Kate’s Lazy Meadow Motel in Mount Tremper, founded by former member of the B-52s, Kate Pierson. Primitive camping in the region’s backcountry is an excellent option for those seeking the rugged outdoor experience or hiking long distance trails such as the Long Path, a 357-mile long-distance hiking trail spanning from northern New Jersey to the Albany, New York area. Primitive camping is camping in its purest form – no amenities, no technology. Just you, your tent, and the great outdoors. 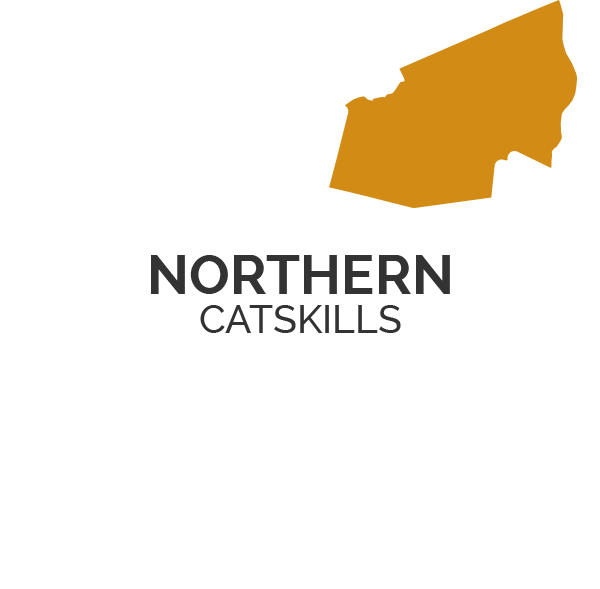 Primitive camping is widely available throughout the Catskill Park and Catskill Forest Preserve. When you camp out in the Balsam Lake Mountain Wild Forest, get up early and hike Balsam Lake Mountain, home to the oldest fire tower in New York. One of the oldest campgrounds in the Catskill Forest Preserve, camping at Devil's Tombstone Campground provides hiking access to the 21-mile Devil’s Path Trail. More structured than some other offerings, Bear Spring Mountain Campground offers 41 tent and trailer sites, as well as horse-friendly sites at the Spruce Grove camping and trail system. 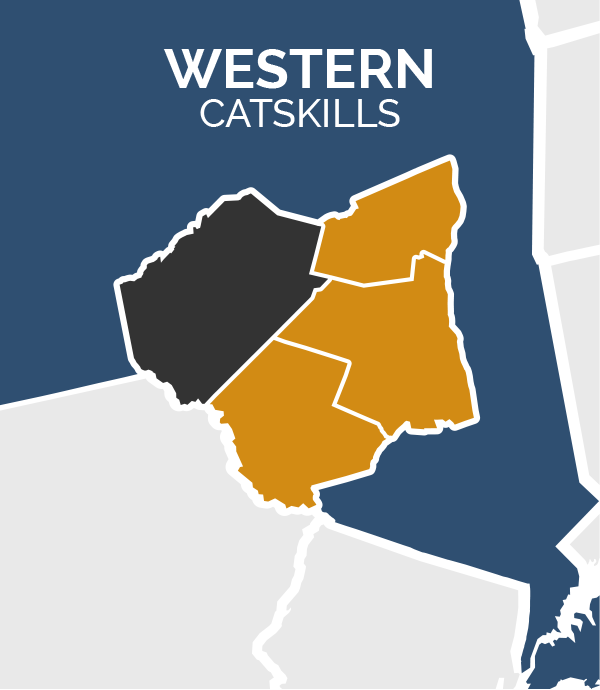 Connecting three of the Catskills’ wilderness areas, including Slide Mountain, Hunter-West Kill, and Indian Head Mountain, this is the perfect place to set up basecamp for a multi-day backcountry camping adventure. Whether you choose traditional, glamping, or backcountry camping, please be respectful of the wilderness around you and adhere to all DEC rules and regulations. Pack out what you pack in, follow firewood mandates, and be cognizant of local black bear populations. Most importantly, take this time to relax, reconnect with nature, and make lasting memories. Pack your gear and head to a Catskills campsite today! Car camping, wilderness camping, RV sites, oh my! 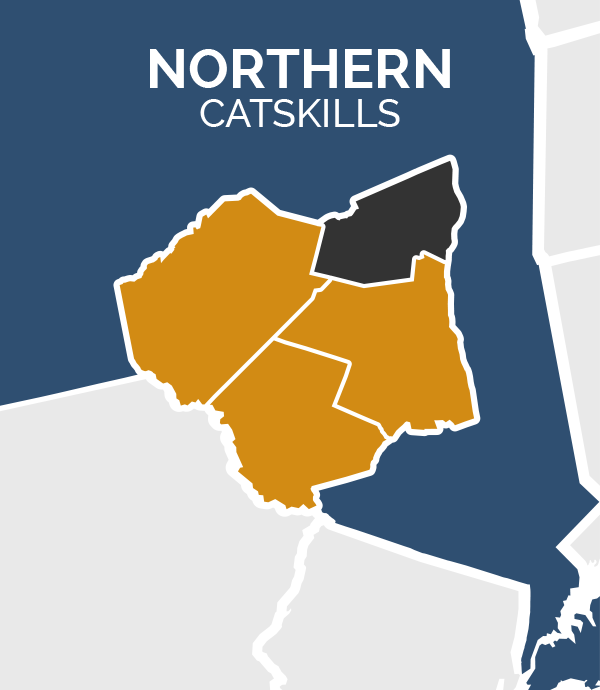 This map will take you to each of the four respective regions that make up the Catskills. Enjoy!